If you're anything like me, you have Obsessive Compulsive Decorating Disorder (OCDD). It is characterized by a marked need to see EVERY example of whatever thing is currently occupying your mental space -- be it paint colors, couches, rugs, lamps, chairs, etc., followed by an overwhelming sense of analysis paralysis, and culminating in a rushed selection, because you just need to BUY something, dammit. Currently this disease is forcing me to shop for a new couch, a new white paint color, and new wallpaper, but in the end I will probably just buy some dumb thrift store tchotchke to abate my compulsion, since none of those big purchases/projects are logical if The Hunny and I actually want to move in the new year. Or, I will just screw logic, and buy something big and cheap that I hate next month. Last night, Karly emailed to tell me that I have 674 Craigslist postings bookmarked. I thought to myself, "Ha, I've likely deleted more than twice that many." So, let's see... that makes over 2000 postings that have caught my gimlet eye in the last year. I think I have a problem, people. But I'm pretty sure it's not my fault. 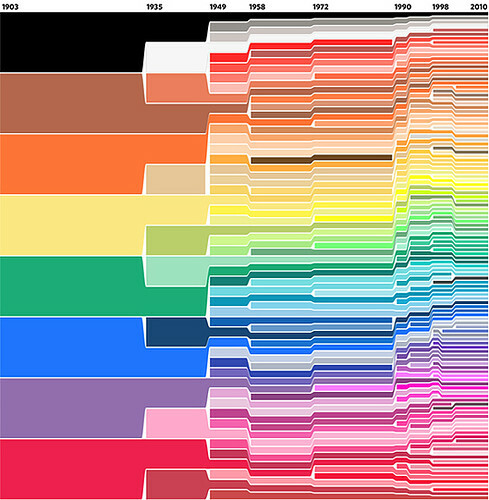 Just look at the history of Crayola colors. At the turn of the (last) century, there were only eight colors. EIGHT. Period. In the last 100 years, the choices have exponentially multiplied, so that I can't even count all the tiny little bars to tell you how many colors there are now. See there? The choices are uncountable. The variations and combinations thereof -- innumerable. And those are just stupid crayons. Imagine how many sofas, white paint colors, and wallpaper patterns, there are today. Maybe I should time travel back to 1903, with its eight-color palette, and order my sofa from the Sears Roebuck catalog, whitewash the woodwork, and wallpaper... with the Sears Roebuck catalog. Which would be fine, except for one tiny detail.